120 Beacon is located on the north side of Beacon, between Arlington and Berkeley, with 118 Beacon to the east and 122 Beacon to the west. 120 Beacon was built ca. 1857 as the home of hide and leather dealer Benjamin Greenleaf Boardman, Jr. and his wife Sarah Bryant (Dennie) Boardman. It was originally numbered 110 Beacon, but re-numbered as 120 Beacon ca. 1862 when homes were built on the south side of the street. 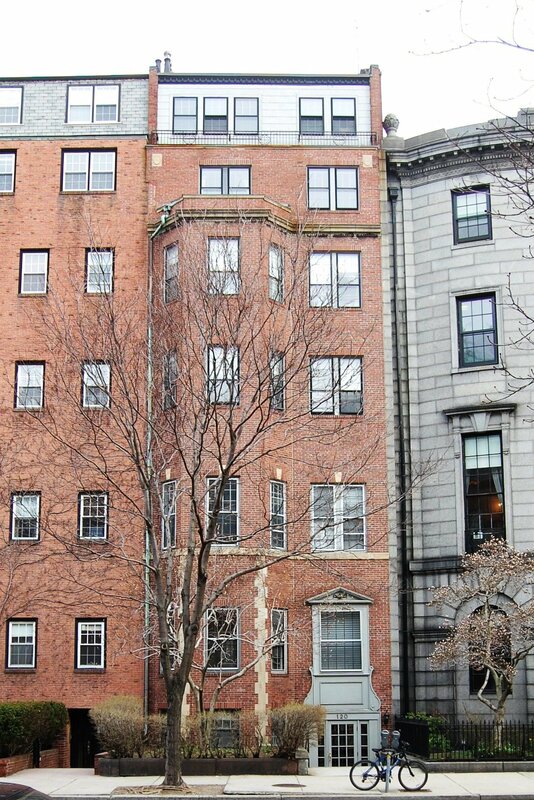 The Boardmans previously had lived at 8 Bowdoin. Benjamin Boardman acquired the land for 120 Beacon on April 12, 1856, from Charles Callahan Perkins, who had purchased it from the Boston and Roxbury Mill Corporation on June 28, 1855. Charles Perkins had married earlier that month to Frances Davenport Bruen and probably planned to build a home in Boston there. They also maintained a home in Newport. He had recently returned from Europe, where he studied music and art, and he and his new wife soon returned there. He became a noted art commentator and later was a founder of the Museum of Fine Arts. Click here for an index to the deeds for 120 Beacon. Benjamin and Sarah Boardman continued to live at 120 Beacon until his death in February of 1887. After his death, Sarah Boardman moved to 299 Beacon. She died in October of 1888. On March 25, 1887, 120 Beacon was purchased from the Boardman family by Charles Archbald Kidder. He also maintained a home in Southborough. He was an investment banker in the firm of Kidder, Peabody & Company, founded by his father, Henry Purkitt Kidder. In October of 1888, Charles Kidder married Josephine Burnett, daughter of Joseph Burnett, the founder of St. Mark’s School in Southborough. After their marriage, he resigned from Kidder, Peabody and they traveled extensively in Europe and Egypt. While in the United States, they usually made their home in Southborough and leased 120 Beacon to others. During the 1888-1890 winter season, 120 Beacon was the home of Mrs. E. C. Jones. By the next season, she was living at 170 Beacon. By the 1890-1891 winter season, the Kidders were living at 120 Beacon again. They continued to live there during the 1891-1892 season. During the 1892-1893 and 1893-1894 winter seasons, 120 Beacon was the home of Oliver Ames and his wife, Elise Alger (West) Ames. They had married in December of 1890, after which they lived in North Easton, where they continued to maintain a home. Prior to their marriage, he had lived at 306 Dartmouth with his parents, Frederick Lothrop Ames and Rebecca Caroline (Blair) Ames. Oliver Ames was treasurer of Oliver Ames & Sons, the pick and shovel business founded by his great-grandfather in North Easton, and an investor in real estate, railroads, and other businesses. He was known as Oliver Ames, II, until the death in 1895 of his father’s first cousin, former Governor Oliver Ames, who lived at 355 Commonwealth. Oliver and Elise Ames had moved from 120 Beacon by the next season, and by the 1895-1896 season were living at 151 Commonwealth. During the 1894-1895 winter season, 120 Beacon was the home of paper manufacturer and former Congressman William Augustus Russell and his wife Frances Spofford (Hall) Russell. They had lived at 146 Beacon during the 1892-1893 winter season. By the 1895-1896 winter season, Charles and Josephine Kidder were living at 120 Beacon once again, and continued to do so until about 1899. During the 1899-1900 winter season, it was the home of wool commission merchant Lawrence Carteret Fenno and his wife, Pauline (Shaw) Fenno. They previously had lived at 22 Louisburg Square. They purchased 238 Beacon in November of 1899 and lived at 120 Beacon while their new home was being renovated. They also maintained a home in Beverly Farms. During the 1900-1901 winter season, 120 Beacon was the home of William Hadwen Ames and his wife, Mary Elizabeth (Hodges) Ames. They also maintained a home in North Easton. William Ames was Secretary of his family’s business, the Ames Shovel Company, and later was president of the American Pneumatic Service Company, which built and operated pneumatic tube systems to deliver mail in Boston, New York, Chicago, and St. Louis. William Hadwen Ames and Oliver Ames (who had lived at 120 Beacon in the 1890s) were second cousins. William and Mary Ames had moved from 120 Beacon by the 1901-1902 season, and were living at 173 Commonwealth during the 1902-1903 season. By 1902, Charles Kidder had re-joined his family’s investment firm, and they resumed living at 120 Beacon on a regular basis. On February 28, 1931, he transferred the property into both of their names. They continued to live there (and in Southborough) until shortly before Josephine Kidder’s death in May of 1937. On June 10, 1937, 120 Beacon was acquired from Charles Kidder by Harry Sirota, and on June 15, 1937, it was acquired from him by real estate dealer Charles D. Kissock. In May of 1937, before the property was conveyed to him, Charles Kissock had filed for (and subsequently received) permission to remodel 120 Beacon into eight apartments, including replacing the front façade and adding a penthouse story. The remodeling was designed by architect Saul Moffie. 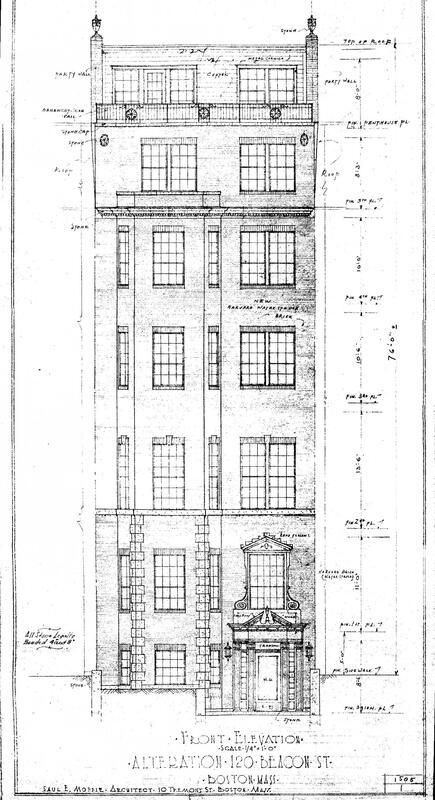 Architectural plans of the remodeled building — including elevations and floor plans — are included in the City of Boston Blueprints Collection in the Boston Public Library’s Arts Department (reference BIN P-147). 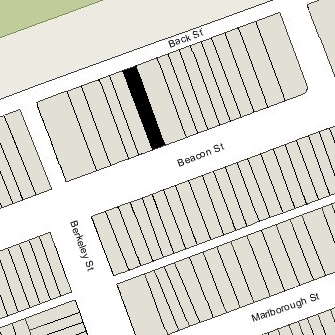 On June 29, 1937, 120 Beacon was acquired from Charles Kissock by One Hundred Twenty Beacon Street, Inc.
On August 7, 1946, 120 Beacon was acquired from the One Hundred Twenty Beacon Street, Inc. (Frederick V. McMenimen, president) by Mary Leone (Grady) D’Amore, the wife of Gerard (Jerry) V. D’Amore, a building contractor. They lived in one of the apartments. They previously had lived in Malden. In October of 1948, Mary D’Amore filed for (and subsequently received) permission to subdivide two of the existing apartments, increasing the total number from eight to ten. On May 17, 1949, 120 Beacon was acquired from Mary D’Amore by Irving W. Boyer and by Frank Lanes and Philip Adam, lawyers and co-partners in the firm of Lanes & Adam. Irving Boyer held one-half undivided interest, and Lanes & Adam held the other one-half undivided interest. Irving Boyer (Israel Levine) and his wife, Nellie (Raphael) Boyer, owned The Sheraton Shop, a furniture store at 717 Boylston. They lived in Newton. On December 31, 1953, and January 2, 1954, Irving Boyer transferred one-fourth undivided interest in 120 Beacon to his son, Robert Boyer, and his daughter, Lillian Muriel (Boyer) Woolf Bernstein, the wife of Sidney Bernstein (one-sixteenth undivided interest transferred by each deed). On December 23, 1957, he transferred one-twelfth undivided interest to his son, Burton Boyer, and his daughter, Lillian Bernstein. On February 14, 1964, 120 Beacon was acquired from the Boyer family, Frank Lanes, and Philip Adam by real estate dealer Edward L. Britt and his wife, Ann M. (Lynch) Britt. On May 4, 1966, 120 Beacon was acquired from the Britts by Harris A. Reynolds, and on June 10, 1966, it was acquired from him by Thomas E. Garrity, Jr., and Snelling Robinson Brainard, trustees of the Charleside Trust. On September 14, 1967, 120 Beacon was acquired from the Charleside Trust by Donald C. Carleton, a stockbroker, and his wife, Sheila Margaret (McNabola) Carleton. They lived in an apartment at 235 Commonwealth, but had moved to an apartment at 120 Beacon by 1969. 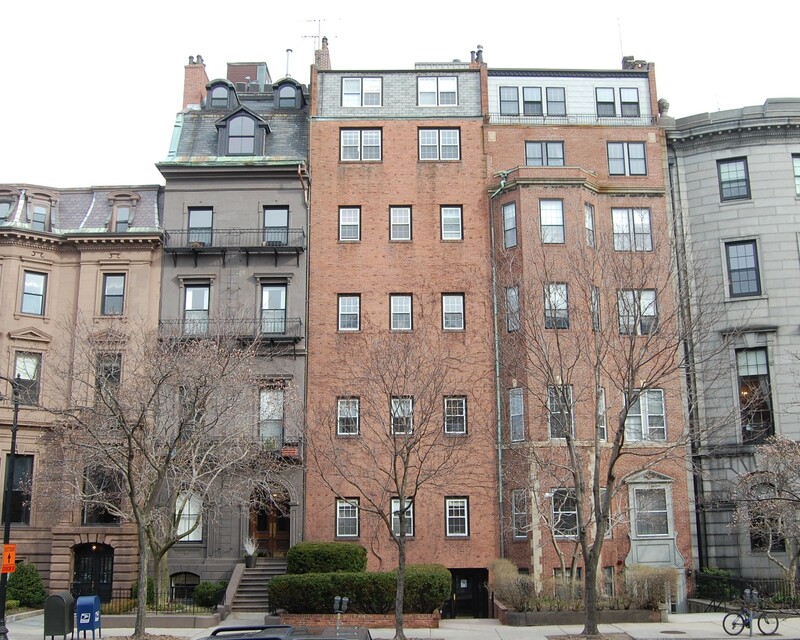 On September 5, 1973, Donald and Sheila Carleton converted the property into eight condominium units, the 120 Beacon Street Condominium.